Section 5 of Getting Through to Jehovah's Witnesses: Now Take Action! 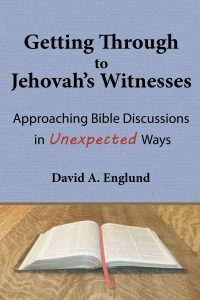 Last time, I gave you brief descriptions of what’s in each of the six chapters of Section 4 of my book, Getting Through to Jehovah’s Witnesses: Approaching Bible Discussions in Unexpected Ways. Now I’d like to give you a short summary of Section 5. From my own experience, I know how easy it is to read a book like mine, get some great ideas, put the book on the shelf, and then do nothing. That’s why Section 5 of my book consists of one chapter which is a call and encouragement to action. The most common opportunity for you to share the gospel with Jehovah’s Witnesses will come when two of them come to your door as part of the witnessing ministry. I trust that now you will be prepared and that you will try some of my book’s approaches. If you do that, you will be doing far more than most Christians will ever do in trying to get through to Jehovah’s Witnesses. But you don’t have to wait passively for Jehovah’s Witnesses to come to your door. Jehovah’s Witnesses you know from your neighbor or workplace. They may or may not be actively spreading the Watchtower message door-to-door. People who are studying with Jehovah’s Witnesses. How I wish when I was studying with them that someone had taken the time to help me. Ex-Witnesses—people who have left the Watchtower for one reason or another, whether voluntarily or involuntarily. People who are attending meetings at a nearby Kingdom Hall. Why not go and reach out to some of them? People with a Watchtower background who are searching for answers on the internet, either through topical searches or through online discussion groups. The paperback edition is available for $14.99; the Kindle edition is available for $9.99. If you order the paperback, you can get the Kindle version free under Amazon’s Matchbook program.